NIST Denounces SMS 2FA – What are the Alternatives? Towards the end of July 2016, the National Institute of Standards and Technology (NIST) started the process of deprecating the use of SMS-based out-of-band authentication. This became clear in the issue of the DRAFT NIST Special Publication 800-63B, Digital Authentication Guideline. NIST Special Publications (SP) 800 series are required by the Office of Management and Budget (OMB) policies for almost all federal agencies. They are not required for privOate business. Nevertheless, they form part of the NIST Risk Management Framework (RMF) that is used by many U.S. organizations as the base framework for their own security policy. Conformance to the NIST RMF would certainly benefit companies wishing to do business with government departments. Due to the risk that SMS messages may be intercepted or redirected, implementers of new systems SHOULD carefully consider alternative authenticators. If the out of band verification is to be made using a SMS message on a public mobile telephone network, the verifier SHALL verify that the pre-registered telephone number being used is actually associated with a mobile network and not with a VoIP (or other software-based) service. It then sends the SMS message to the pre-registered telephone number. Changing the pre-registered telephone number SHALL NOT be possible without two-factor authentication at the time of the change. OOB using SMS is deprecated, and may no longer be allowed in future releases of this guidance. Since SMS-based 2FA is common among organizations that track RMF, a large number of U.S. businesses will need to change their remote authentication processes or deviate from NIST guidance. Is deprecating SMS-based 2FA good advice? SecurityWeek talked to consultants, vendors and practitioners – and found a divergent range of views. But, he added, this doesn’t mean that SMS needs necessarily be abandoned by business. Not everyone agrees that this means SMS need necessarily be abandoned. Nor does he believe there should necessarily be a blanket ban on one-time-passwords. “NIST’s main issue appears to be sending a code to an unverified phone.” His solution is to verify the phone rather than abandon the idea. “I think certain agencies are trying to scare companies into buying more security technology and services,” Bailey said. “Somebody is getting rich off of what the hackers are doing to corporations. Mostly, the result is embarrassment and not financial theft. I think it’s a money grab for somebody.” This viewpoint is fueled by the cost that will be incurred if companies are forced to move to alternative methods. One new and evolving method of authentication is gaining traction with the practitioners: behavioral biometrics. 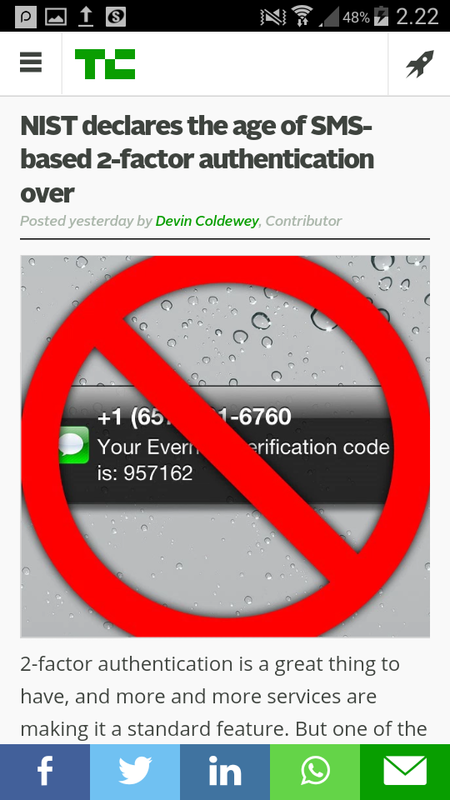 This solves an underlying problem for almost all forms of authentication: user friction. User friction is the degree of effort required from the user, such as remembering and entering long and complex passwords, or typing in an OTP from a separate device. Behavioral biometrics is sometimes also described as passive authentication: the user doesn’t need to do anything extra (which would be active authentication). Finance companies are already moving in the direction of passive biometrics in the form of certain physiological biometrics. This year MasterCard announced that it would roll out a new payments authentication process involving facial recognition (selfies). In July Barclays Bank announced that it would replace passwords with voice authentication for its telephone banking service. Authentication remains one of security’s biggest problems. Using multiple factors makes authentication stronger, but increases costs.